Below are some suggested titles that may have good pre-order potential and/or have added value to entice customers to pre-order from their local indie. The list will be updated on a regular basis. When available, titles will link to a page with downloadable digital assets. The list is also available as an Excel Download at the bottom of the page, as well as ABA-created "Keep It Local" Pre-Order Shelftalkers. The Border by Don Winslow (William Morrow, 9780062664488, Hardcover, $28.99) Added Value: 10-copy signed carton (ISBN 9780062898913); available while supplies last. Please place your order at least one month prior to the on sale date. The Priory of the Orange Tree by Samantha Shannon (Bloomsbury Publishing, 9781635570298, Hardcover, $32.00) Added Value: Offer your customers an exclusive poster signed by the author when they preorder a copy with your store. 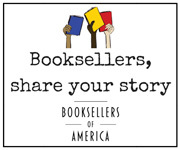 Submit the quantity of posters that you’d like to receive to your Macmillan rep by January 26, 2019 and Bloomsbury will ship them to your store no later than March 29, 2019. Fulfillment to individual customers will be the responsibility of the bookstore. ﻿The School for Good and Evil #5: A Crystal of Time by Soman Chainani (HarperCollins, 9780062695178, Hardcover, $17.99)Added Value: 8-copy signed carton ($143.92, 9780062895608); available while supplies last; to receive by the on sale date, place order by 2/10/19. Bloodleaf by Crystal Smith (HMH Books for Young Readers, 9781328496300, Hardcover, $18.99) Added Value: Signed editions available for order (while supplies last). Sweeping Up the Heart by Kevin Henkes (Greenwillow Books, 9780062852540, Hardcover, $16.99) Added Value: 6-copy signed carton ($101.94, 9780062905932); available while supplies last; to receive by the on sale date, place order by 2/25/19﻿. The American Agent by Jacqueline Winspear (HarperOne, 9780062436665, Hardcover, $27.99) Added Value: 10-copy signed carton (ISBN 9780062899644); available while supplies last. Please place your order at least one month prior to the on sale date. How to Love a Country: Poems by Richard Blanco (Beacon Press, 9780807025918, Hardcover, $19.95) Added Value: Limited run broadside﻿. Defy Me by Tahereh Mafi (HarperCollins, 9780062676399, Hardcover, $18.99) Added Value: 8-copy signed carton ($151.92, 9780062895493); available while supplies last; to receive by the on sale date, place order by 3/11/19﻿. If I Had Two Lives by Abigail N. Rosewood (Europa Editions, 9781609455217, Paperback original, $18.00) Added Value: 26-copy signed carton; must order by carton, minimum order is 1 carton, max is 2; first come, first served; order deadline is 3/1/19. Mrs. Everything by Jennifer Weiner (Atria Books, 9781501133480, Hardcover, $28.00) Added Value: Exclusive enamel pins for giveaway available to indie stores by request. View sellsheet for more information; order by 3/25 via the S&S website; while supplies last. The Nickel Boys by Colson Whitehead (Doubleday, 9780385537070, Hardcover, $24.95) Added Value: Signed first editions (not tip-ins) and limited edition bookmarks. Promo kit available; ask your sales rep for details for sign-up by 3/20/19.